Whether you plan to set your wood model plane to flight at the nearest park or just want to display it in your bedroom, you'll first need to learn the basics of constructing it correctly. You don't want to be the laughing stock among friends when your plane does not fly or it falls apart from shoddy construction. If you are putting it on display instead of flying it, you want it to be in a state worthy of presentation, not to look like it instead belongs in the nearest trash compacter. Some wood model planes use balsa wood, which is a thin wood that is lightweight enough to glide, but also pliable enough to use for constructing the plane. 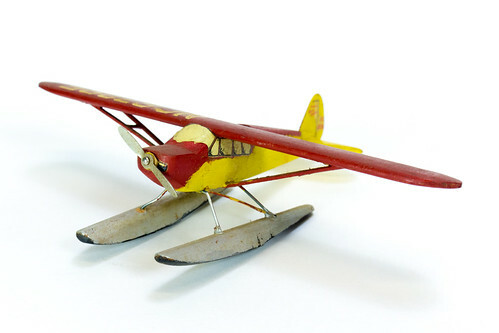 Wooden model planes can also be constructed of other woods, but balsa is the most popular. You can either purchase sheets of wood and design your own plane or you can purchase wood model plane kits. Some kits will come with everything you need, while others will not. Be sure to check the packaging to see what you are getting. One of the most important materials to have for your wood model plane is a good hobby knife. These can be purchased online or at local craft or hobby stores for a small cost. This is especially important if you will be designing your own wood model plane or if your kit does not come with pre-cut shapes. Also equally important is a good bonding glue. C/A glue and white glue both work well for balsa wood, as well as many other woods. Keep a ruler around for measuring and also for drawing patterns. It's also good to have a pencil for drawing any pattern lines. A regular #2 pencil is fine. Wax paper is great to put underneath the working area so that the wooden model does not stick to the work surface. If you use plain newspapers, like with other crafts, the balsa wood may accidentally get glued down to the newspaper. With wax paper, this problem can be prevented a little better. Also keep some fine grit sandpaper handy for your wood model plane. Sandpaper may be needed to smooth any rough edges. Be careful if you're using balsa wood. This type of wood is very thin as it is, so you don't want to overdo it on sanding. One or two sweeps is generally enough. If you would like your plane to be radio-controlled, you will also need to purchase the supplies for that, including an engine. Also there is paint, decals, and other decoration and model plane accessory materials to consider. Perhaps you've walked past a stunning display of die-cast metal model cars. Maybe one of your buddies has an award-worthy collection that you're envious of. It could be that you just saw some in a magazine and thought they were cool. Whatever the reason, you are likely eager to get started on building your first die-cast metal model car. Building a die-cast metal model car can be a fun project. It can sometimes be more time-consuming than is thought by just looking at the package. But, once it is done, you will hopefully have something nice to display. Before you get started, there are some things you should know about building a die-cast metal model car. The first thing you will need to do is choose your building kit. The kits are sold at craft and hobby shops and come in various skill levels. Building a die-cast metal model car can be fun, but if you've never done it before, a beginner's kit is best. The more difficult building kits are best for those who have done this, or something similar, at least one time, if not more. Choosing which type of car to build can be part of the fun that comes with these cars, especially if you are a car enthusiast. The materials needed will depend on the kit you purchase. Some kits come with everything you need, including the paint. Other kits only come with the basics. You may also choose to customize your die-cast metal model car with accessories, such as racing decals, custom rims and tires, a racing engine, or even a hydraulics kit. There are many different accessories and custom options available for building a die-cast metal model car. Some of these even come with the kits. There are also some basic supplies to have on hand, even if your model building kit comes with them. Sometimes there will not be enough glue or paint included, due to extra gluing or painting with multiple coats of paint to get the look you want. Hobby paint, such as Testors brand, sold at Hobby Lobby, is good for a die-cast metal model car. It's less than 5 bucks and you likely won't even use the whole container on just one car. Don't forget the brushes. Also useful for building your die-cast metal model car are a hobby knife, wax paper, and clear acrylic for the protective coat. Testors brand also has a good finishing coat. When building your die-cast metal model car, you may also wish to have some internet resources handy, such as those that offer tips & suggestions, ones to purchase your supplies from, or just those that are interesting to anyone building a die-cast metal model car. Some useful websites include ModelCarsMag, Hobby Lobby, RC Tek, and Model Car Hub. Welcome to Crafting Successfully ! Here you will find articles about art, art history, art philosophy, DIY crafts, project ideas, lesson plans, material suggestions, and more. If it's related to art or crafts, you will find it. All ages, stages, and grade levels will be represented from 0-1000!